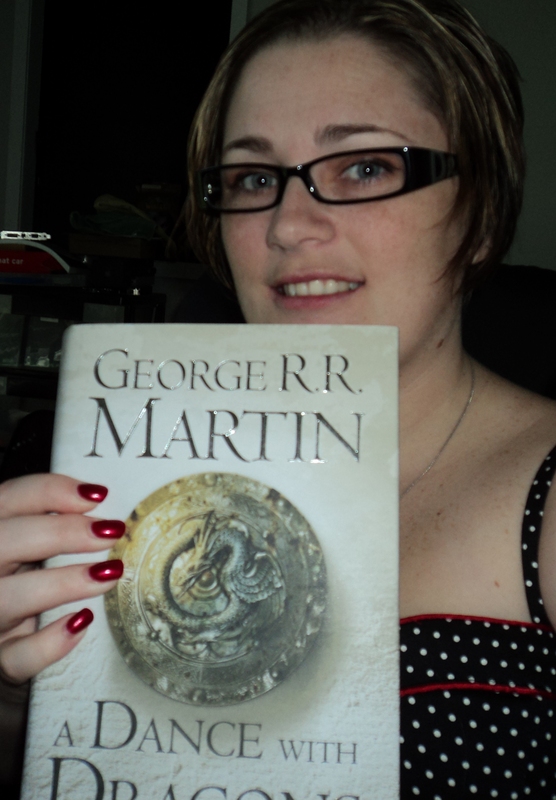 I managed to acquire a copy of A Dance With Dragons by George R R Martin (aka, my hero) on July 12, the very day it was released. In fact, as I arrived at the bookstore, they were in the process of unpacking and sorting their preorders. I gleefully posted a picture of myself with the book on Facebook and tagged all my fellow obsessives to show off. Sadly, I have only managed to read two chapters since then, so everyone I annoyed by posting this photo is likely to bombard me with spoilers very soon. My goal for August is to finish the damn thing (FYI, it’s huge). Accountability on my WIP-wise – I have been spending some time inside the heads of two of my main characters and fleshing them out to the point where I’m actually ready to start writing my next few chapters, which I am very excited about. My goal is to have this very close to being fully realised before I go back to work in November. I am only halfway through the 3rd book in the series. On the one hand, I can’t put it down because it is so enthralling part of me wants to race through so I can catch up with everyone else and visit sites and discussion boards without spoiling things for myself. On the other hand, I want to savor every drop – I have never found a series like this that I’ve enjoyed so much!